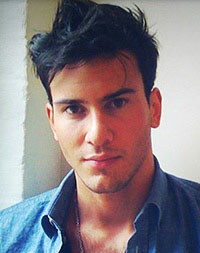 Steve Gold was born in Stamford, Connecticut, United States, on March 1, 1985, is an American male model and real estate broker. He was discovered after his friend brought him to a casting call in Manhattan. He began his modeling career at age of seventeen, signed with Major Model Management in New York City. He made his modeling debut for Louis Vuitton in Paris. He is also luxury real estate agent, who is now a senior sales associate at Prudential Douglas Elliman, got his license in 2007. Gold's hobbies are tennis, skiing, surfing and ice hockey. Regularly post pictures on Instagram with his dog, Pablo who he rescued from shelter in Georgia. He started dating New York City socialite, Brittny Gastineau in May 2018. Featured in reality television series Million Dollar Listing New York (2017-2018). Vogue Hommes, Arena Magazine, Details, GQ Germany, GQ Magazine Spain, Z Magazine, Vogue Russia, Pop Magazine. Jack Victor, Barney's, Husky, Givenchy, Iceberg, Sasch, Salvatore Ferragamo, Armani. Walked runway for Iceberg, Tommy Hilfiger, Louis Vuitton, Givenchy and Giorgio Armani. Represented by agencies Major Model Management New York. Life is a continuing education. Love is blind but friendship is clairvoyant. I’m not super into celeb culture, I treat them like any other client and I think that’s kind of what they want. Last year I sold well over $100 million in real estate. I want to be the best at what I do, I always have, I've always been a competitor my whole life. So I don't like to be beat by anyone. I don't need to fake being someone I'm not. Someone should hire me because of my knowledge. I am what I am, and so far it's worked for me. I didn’t want to do this job badly enough to just sell studio apartments or rentals to college kids, if you’re gonna do it, do it big.